Don’t fight it. If luxury is what you want (and can afford), luxury is what you get here at the Oberoi’s Wildflower Hall just outside Shimla. Enter grumpy, out of sorts, achey and slightly carsick from the switchback ride up from the plains, and within seconds, the ambience and staff start to undermine your disgruntlement. Everything conspires to reassure you that life is good, that you are precious, that the world is your oyster. In my quiet and tasteful room, they’d even put a bowl of cherries as if to hammer home the point. I am eyelevel with the tops of pine trees that are dripping ice crystals from a hail shower. The sky is murmurous with thunder. The air tastes like chilled wine. For the first time in it feels like years, I have goose-pimples. I live in Delhi. It is May. Ergo my bronchioles are twitching around like mud-skippers under mini-dunes of Thar desert sand, my sebaceous glands are on permanent triple-time, my pores are clogged, my hair is limp. In short: I’m a wreck. And there’s still five months of summer to go. There’s only one thing left to do: pray to the small God of Large Travel magazines that he’ll call up and send me somewhere nice. All hail to thee, Ed. It is more than ‘nice’. ‘Nice’ doesn’t even begin to get anywhere close to this. The original Wildflower Hall was built in the 1860s: a country cottage where Viceroys and their consorts would consort. 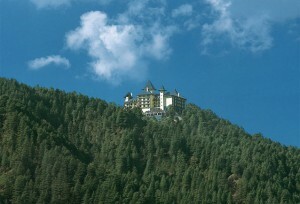 After Lord Kitchener’s brief tenure in the early 1900s, the property was sold to the Holtz family who converted it into a quaint, three-storey hotel in 1925, and it remained in this incarnation, more or less unchanged (although latterly run by Himachal Pradesh’s tourist authority) until March 1993, when disaster struck. The entire building went up in flames. The government tourist-wallas were gutted, and so was the hotel. Enter Mr M.S. Oberoi, with an international luxury hotel chain to his name, pockets as deep as his aspirations are high – and a local lad to boot – to raise the Wildflower like a phoenix from the ashes. “Build me a fairytale castle in that thar forest,” quoth he (I’m paraphrasing), “and don’t stint on the Burmese teak.” Very many crores later (I can’t be more specific since the matter is sub judice, but rest assured it was a pile), and the Wildflower Hall reopened to gasps of wonder and delight in April 2001. Whilst the gasps from ordinary folk may result by glancing at the tariffs, the jet setters and high fliers, the Sonias, Priyankas, and assorted Bachchans, the corporate heads and steel magnates and sundry Outlook Traveller correspondents rise above such petty concerns. With its turrets and towers, and sylvan surrounds, Wildflower Hall not only sounds like something out of Hans Christian Andersen, it looks a bit like that too – although its fairytale aspect took on a new a sinister tone, when I was informed that just like Baron Von Bomberg’s castle in Chitty Chitty Bang Bang, which it spookily resembles, no children are allowed here either. Like Ananda, the emphasis at Wildflower is on “wellness”, but unlike Ananda it is less a spa where you can also stay than a hotel with spa facilities available. As with all the other Oberoi hotels, the spa is managed and run by The Banyan Tree – an originally Thai company that is perhaps the best known and most widely respected name internationally. The bouquet of hands-on, non-clinical massages and treatments available are supplemented here by dietary advice provided by the in-house Ayurvedic doctor, and yoga sessions led by the utterly charming and smiley instructor, Dinesh. It’s not so much the attentive staff who flit around at the edge of your vision like uniformed seraphim anxious to fulfil your every whim and wish; it’s not the food which is fresh and piquant and perfectly proportioned; it’s not even the wall-to-wall Burmese teak (and gosh, there’s a lot of it) which makes the interiors simultaneously grand and intimate and makes you want to rub up against the walls purring gently; it’s not even the sumptuous spa (of which more later). It’s actually not even the hotel itself, but what it’s surrounded by. Acre upon acre of dense forests of cedar (deodar), spruce, blue pine, green oak; on a clear day, a paradisial vista of the fading blue hills separated from the sky by the magnificent ice-streaked peaks of the high Himalayas. The philosophy at Wildflower is to blend activity with relaxation, natural beauty with manmade luxury. There is nothing quite so satisfying as the idea that this (whatever “this” might be: a session in the sauna, an aromatherapy massage, a Himalayan spice body wrap) is a well-deserved treat for that (whatever ‘that’ might be: a canter though the woods on a polo pony; a mountain bike ride; a trek in the forest; a day-trip out river rafting on the Sutlej). And finally, there was the sudden and happy realization that wherever you walk – be it town or countryside – you’re always half way up a tree. The following day, I decided to get to know the forest on horseback. I was led to the most docile of the three handsome polo ponies owned by the hotel and, flanked front and rear by the two other riders, we sallied forth along the trails past apple orchards and through the forest. My horse was fine going out, but she was obviously keen to get back, and I had to summon up all my Sagittarian traits (I’m Cancer) to stop the trot. Even so, I arrived back at the Hall with a thoroughly pummelled coccyx and very achey knees. Determined to prove the stars wrong, I decided to follow up on the Sagittarian theme and try my hand at archery. Dheeraj instructed me on the finer points (the bow goes this way round, mind the pointy ends of the arrows etc.) and I let fly. Okay, so I’m no centaur, but for a first timer, I have to admit, I was not half bad. The next day, it was impossible to stay abed while the sun was gilding the mountain tops and the morning sky unveiled itself cloudless azure. Namaskar, Surya, said I, and promptly did a few. Then it was down to the heated indoor swimming pool for a few lengths beneath the chandeliers, a quick bout of bubbly in the outdoor Jacuzzi while the sun rose up to take a better peak at the proceedings, a splendid solitary sauna, an invigorating shower and then off to the morning yoga session on the grassy knoll facing the main hotel. Our instructor, Dinesh, bounded along, springy as a sapling. “Lose the boady,” he urged us. “Bend your knees. Slowly-slowly as per your capacity.” In fact, ‘losing body parts slowly-slowly as per your capacity’ seemed to be the theme of the entire class. In the dappled shade of the deodars, with the mountain air in my lungs, chanting Om at the Himalayas, the grass beneath my bottom, butterflies flittering around – it was all just too perfect. Definitely time to head spa-wards. I was led out of the hotel and into the forest by the masseuse, a gem of a woman aptly named Diamond, to one of the two spa suites that are located in the grounds. One entire wall is floor-to-ceiling glass, reinforcing the impression that you are entering a super deluxe 5-star fantasy treehouse. Lying naked and being rubbed with sesame oil and haldi, Balinese-style, I vowed to never return to those dusty plains, to live forever in the cool, cosseted comfort of Wildflower Hall. Who needs Delhi? I wondered, and passed into that blissful semi-coma that a really deep massage induces. From massage table to steam room to be lightly momofied, then a quick plunge into a cold shower to get those pores snapped shut, taut and young again, and I was ready for the short walk back to the main hotel for Earl Grey tea in a china pot and home-made biscuits on a platter. The only problem now was how the gracious manager would get me out of there and back to Delhi without resorting to a shoehorn and a couple of burly Jats.